Mark Wisniewski‘s novel Show Up, Look Good, likened to The Catcher in the Rye by DeWitt Henry and praised by Jonathan Lethem, Molly Giles, Kelly Cherry, T.R. Hummer, and Christine Sneed, will be published soon by Gival Press. 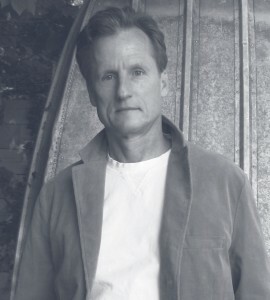 His first novel, Confessions of a Polish Used Car Salesman, was praised by the Los Angeles Times and C. Michael Curtis of The Atlantic Monthly and went to a second printing one month after publication. Short fiction of Mark’s has won a Pushcart Prize and appeared in Best American Short Stories and magazines such as Antioch Review, The Southern Review, The Georgia Review, New England Review, Virginia Quarterly Review, Triquarterly, Glimmer Train, and The Sun. Tell us about any mentors you have had. Mentors were important because where I grew up there were no writers. There were pieceworkers and cops and construction workers and garbage collectors. There was one lawyer and my parents wanted me to be like him because he was able to afford eight kids, and the whole point of life was (I guess) to raise as many kids as you could create. It was a very idealistic yet recession-oriented upbringing wherein wanting to be a writer was insanity. So I trained myself to not want to write. Then, after I left that part of the country, I met a few writers and realized, Damn, a person can do this. Can you talk about your own ways to unblock creativity? For me a good way to get going is to read until I find something I like, then take some structure from it, like maybe the structure of the first sentence, and put my own words into that structure. This can take off pressure and start a flow. Of course even easier is using nicotine, but I quit that because it was killing me. How do your stories and poems happen–do they find you? Do you plan what to write? How do they arise? I don’t know how stories and poems happen. To say they find me sounds more woo-woo than I’m comfortable with but for the most part accurate. I’d also say they don’t find you unless you’re looking for them. It’s like bird-watching, I suspect. I mean there’s this guy who walks around the lake here, a birdwatcher, and he has the hat and the binoculars on the leather strap around the neck and the hiking boots and the whole khaki get-up and even the beard, and you just know he sees a lot more birds than I when I walk in jeans and a T-shirt to get the mail. Then again while he’s seeing birds, I might see a poem. What is your favorite writing environment? Do you prefer quiet? My office. And there’s a certain level of dishevelment that’s ideal for writing. Too much and I feel like a hoarder of crumpled drafts–too clean and I feel like a beginner. Beside my desk, on one of the file cabinets where things on the floor are supposed to go, is a boom box I purchased in ’97–with proceeds from Confessions, in fact. The radio button is broken, and the CD compartment is held together by packing tape. But beside it are hundreds of CD’s, and I blare those bastards. When I try to sleep, there’s ringing in my ears. What are you doing now in your writing world? Promoting Show Up, Look Good. This takes a lot of time, and it ruins concentration and devotion to new material. In other words, I saw zero poems on my walk to get today’s mail. I’ve been seeing too many galleys, emails, and Facebook messages. Could you talk about Show Up, Look Good–is there anything you would like to tell us relating to the writing of it, and the publishing of it fourteen years after your first novel? The writing and publishing of Show Up helped me finally face the truth that there’s a wellspring of cruelty in publishing. I’d sensed this since I’d begun writing, and as Confessions was agented and published I encountered plenty of deceit, and even antagonism, but I sort of denied their existence, as most writers do. I mean, seriously: how can a writer, on a daily basis, admit to the publishing industry’s meanness–on top of the lit-world’s never-ending wars regarding gender, genre, east coast v. west, race, MFA v non-MFA, sexuality, religion, class, and so on? If you admitted to how embroiled the literary milieu is, you’d never draft a thing, let alone revise and submit. Denial can be good, I think you are saying, or we may not wake up! Well, the fact is, literary malevolence will never die. It’s why Confessions took years to get published even though it had two of the best agents out there, and I think it’s why Show Up took so long to get published. And it’s why Show Up will face the usual sniper fire of backlash most any acclaimed book faces, as did Confessions just after it was published–even though Confessions is now considered a kind of literary darling. No writer likes to admit to being criticized, because to do so might mean bad publicity. And what’s been a kind of double-whammy for both Confessions and Show Up was that the narratives in them expose and ridicule selfishness, rudeness, and abuse. SHOW UP has a chapter about the cutthroat snobbishness of literati, and the book’s narrator makes it clear she detests such people. I’m grateful Robert Giron at Gival had the grace and fortitude to publish a novel that’s direct and unafraid. Because, yes, novels like Confessions and Show Up will take a few lumps here and there, but in the long run, any honest narrator will find love. What will be next ? Next for me is to get back to a novel that was abandoned in the same manner Show Up was once abandoned. I have another novel that agents asked me to write, agents fought each other for, and house editors rejected. That process has confused me over the years, but I understand it more lately. Anyway this novel I want to get back to is more serious than Show Up, and I want to revise it one more time to make sure the rejection it faced wasn’t my fault. You know: sometimes these agents get so excited about making money they rush an author, and the author’s book suffers and doesn’t get published, and then the agent falls out of love with the author, leaving the author and the book in an odd place. But of course that doesn’t always mean the book wasn’t good. Sometimes it means the book’s good but needs work. The Fictionaut Five is our ongoing series of interviews with Fictionaut authors. Every Wednesday, Meg Pokrass asks a writer five (or more) questions. Meg is the editor-at-large for BLIP Magazine, and her stories and poems have been published widely. Her first full collection of flash fiction, “Damn Sure Right” is now out from Press 53. She blogs athttp://megpokrass.com. I really enjoyed this interview. Congratulations! I can’t wait to read your book Mark. See you at your reading Mark! This was a great interview Meg. Thanks to you both! The edge in this interview is almost a spice. Hey Mark, I really enjoyed your interview. Am psyched to pick up your book, as I loved your last one. It’s been nice to have brief exchanges through Facebook, and other networks. Hope our paths cross one of these days…maybe AWP in Chicago? Thanks, Ann (I think). @ Robert: Glad to know you’ll get a copy SHOW UP–by the way, it’s now pubbed & available on amazon (link below)–& thanks for the kind words. Yes, will be at AWP this year. But wait–aren’t you in Milwaukee? If so, I’ll be reading/signing for SHOW UP at Boswell Books Nov 23 (night before Thanksgiving), & there may be some drinking festivities afterward. Perhaps you can make that sucker? Mark has always been one of my fav writers. interesting interview, especially on the mechanics of the author-agent relationship. alas, i could not find an excerpt of “show up, look good” anywhere, or a kindle version (1st free chapters work like a charm to break down buyer resistance to good books)…thanks! I sympathize and congratulate you on finding a home for your courageous and direct work, Mark! What gets me about SHOW UP is that (so far at least) its sales numbers are better than the numbers of a lot of agent-sold, large-house titles, some of those titles w/ serious promotion $ behind them. I mean sometimes the experts are just plain wrong. & the financial reports of most large publishing houses–as well as the level of illiteracy in this country–provide numbers that prove this. By the way: looking forward to drinking w/ you Friday.